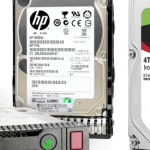 In this article we will consider the basic types of hard drives for servers: how they differ and whether they should be necessarily from the server manufacturer’s brand. Server hard drive should be always ready to respond to many requests with minimal latency and to provide a high level of data integrity. Response Time — users don’t have to wait until the server disk “awaken” and process their requests. How to Choose Right HDD for Your Servers? SAS Enterprise — spindle speed 10000 or 15000 rpm. At first you need to decide what type of the connection interface you want — SATA or SAS. The SATA interface is a further modification of the IDE, which was later renamed to PATA. This interface is initially focused for the use on home computers as well as industrial systems with moderate requirements for performance and reliability. At the same time, SAS is the successor of the classic server SCSI interface. Initially SAS interface has more bandwidth than SATA. But in the 3-rd generation, SATA III has a maximum bandwidth of 6 Gb/s, as well as the second generation of SAS. Nowadays servers with a third-generation SAS-controller is available, with a bandwidth up to 12 Gb/s. For connection, SAS-disk server must be equipped with the appropriate controller. This provides backward compatibility interfaces to SAS-controller can be connected to the SATA-drives, and makes vice versa impossible. SAS provides full-duplex communication: the hard drive handle two commands at the same time (one read and one write command), and SATA-drive — either to read or write. But this advantage is noticeable only in case you are using large number of disks, if you compare SAS NL and SATA RE. If we’ll take a look from intermediate results point of view, SATA-drives are good for creating bulk storage, which is not require maximum performance. And in case you need a fast disk subsystem, your best choice is SAS. No support for hardware RAID-controller commands. Of course, the cost of ordinary desktop SATA is significantly lower than that of the server, and nothing prevents their use for small tasks that do not require high performance from disk subsystem. If the integrity and access speed to data is on the first place, it is still strongly recommended to take the server hard drives. Rich self-diagnostics allow timely notify about imminent disk failure. Another important difference of the server hard drives — the level of unrecoverable error. Ordinary SATA is about 10-14. It means that while you overwriting 2 TB drive 6 times, you will almost certainly get one unrecoverable error. For home disks it is not a problem, but if you need to overwrite the database each month, then 6 months later it can be damaged. For SAS disks level of non-recoverable error even lower — it is 10-16, for SATA RE / SAS NL — 10-15. Note. Potential for error is proportional to the number of drives into a RAID-array. How Does SAS-disk Provide a Lower Error Rate? Advanced data recovery algorithms without controller. The form factor of disks installed in the server also determines the capacity of its storage system and, at the same time, its energy efficiency. Currently, only two disk sizes are available and relevant in servers: 3.5″ and 2.5″. 2.5″ is a common size for HDD and SSD, although these disks are only one inch smaller in size, they use much less power than their 3.5″ relatives. Currently, the maximum volume of such disk is 2TB (for example, take a look on DELL 2TB 7.2K SAS 2.5″ or Hewlett Packard Enterprise 2TB SATA). Compared to their larger satellites, 2.5″ hard drives are not only saving, but also offer better read/write speeds when working in an array of several media. So they are ideal for use in low-power systems or for systems with maximum performance requirements. The main parameter of each drive (HDD or SSD) is capacity. As mentioned above, 3.5″ hard drives can store up to 10 TB, and 2.5″ hard drives are now available with a maximum capacity of 4 TB, and solid state drives are available up to 1 GB. It is not always advisable to select the maximum capacity drives to obtain a certain capacity for server. The hard disk should not be installed in the server in the singular, but should always be combined into groups of two (at least) to ensure reliable operation. For example, if it’s planned to equip the server with a disk space of a total of 2 TB, it’s much better to buy 1 TB disks and then configure them into a RAID1 or RAID 10 array (in such situation any failure in one of the disks does not lead to the data loss). This is one of the reasons why the capacity of server hard drives is usually lower than for desktops. Economic (ECO) — disks in this class have a low price per unit. The level of performance and reliability of these drives determines their purpose for entry-level systems. They should be used in non-critical areas with low I/O loads and moderate speed requirements. High loads can lead to a deterioration in their reliability. ECO drives run at 5400 or 7200 rpm and usually have a SATA interface. Business Critical (BC) or Nearline — disks in this class offer high capacity with a minimum cost per 1 GB. They are designed to provide good performance and suitable reliability. Depending on the implementation of the server, “BC-disks” can be equipped with SAS or SATA interfaces and have a speed of 7200 rpm. Enterprise (EP) — disks of this class provide maximum performance and reliability. They are designed to cope with the maximum workload. This class uses the SAS interface and has a rotational speed of 10,000 and 15,000 rpm. SSD Enterprise Performance / Mainstream — these drives offer the best performance and durability in the SSD segment and are thus ideally suited for use in systems with high demands on I/O. Enterprise Performance SSDs (SLC or MLC technologies) offer better I/O performance with the SAS interface. In contrast, Enterprise Mainstream SDD (MLC technology) has a SATA interface and is more affordable. For these tasks, it is preferable to use SSD on a Marvel chip, for example, some Crucial SSDs (Crucial MX300 1TB) or at least OCZ on RD400 (Toshiba OCZ RD400 1 Tb). Disks on the chip SandForce (SF) are better avoided. Finally, the most important question: do you need to buy a brand drives? There is no secret that HP, IBM and DELL do not produce hard drives. They buy them from third-party manufacturers, and then test them, reflash and put their logos on them. 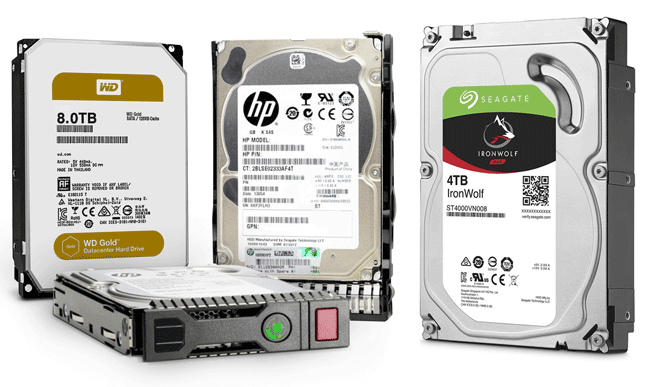 But “native” hard drives are about two or three times more expensive than the same model, but with the logos of non-native manufacturers – you can purchase Seagate, Western Digital, Toshiba, HGST and we are sure, that such difference in price is not justified for all the promises of increased reliability. DELL servers — from 10 generations. According to the statistics, most reliable are Hitachi drives. In second place Western Digital, on the third – Seagate. If you decided not to buy “non-native” hard drive, at first you must ask the seller: who provides the warranty? It is the fact, that many stores do not provide a guarantee on the hard disks, referring to the manufacturer’s warranty. But there is a subtle point: for example, some models of Seagate warranty period starts from the date of production. So do not exclude the situation that you can purchase a brand new drive, which is over the manufacturer warranty. To increase the reliability of the disk subsystem, it’s desirable to use disks from different parties on a single server in a RAID array.